Daydreaming of your next beach vacation? 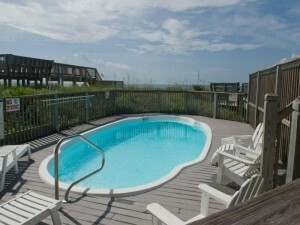 Then Reverie is the Emerald Isle beach rental for you. 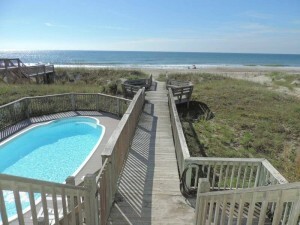 This dream of a rental is the perfect place to bring your family for a relaxing beach getaway, whether it be for just a week or the whole summer. At Reverie, there’s room for the whole gang. 5 bedrooms and 6 bathrooms include four spacious oceanfront master suites, each with a private balcony overlooking the coast. The fifth bedroom houses 2 bunk beds and 2 futons. This spacious setup provides plenty of room for multiple families to share the home while maintaining individual privacy. A fully-stocked, eat-in gourmet kitchen has all the tools you’ll need to feed the group, with double ovens, 2 refrigerators and 2 dishwashers. The spacious open floor plan allows your group to spend time together in the large living room, or separate into the loft, game room or second living space. Worried about getting around? No need! A convenient elevator will take you from the ground to the top floor in no time at all. Oceanfront only begins to describe the spectacular amenities featured at this home. 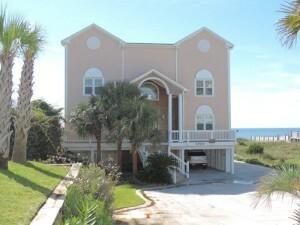 Just steps from the beach, your private walkway stands between the back porch and your toes in the sand. To take in the scenery from a distance, bright windows in each room give a panoramic view of the Oceanside, and the deck allows you to enjoy the breeze. Rather swim in a pool? Take a dip in your own private swimming pool overlooking the salty waves. Want to see what previous renters have to say? “We have now returned to Reverie for 4 years in a row. We have tried numerous rentals prior to Reverie. It is our family reunion and extended family destination and it is like our second home. 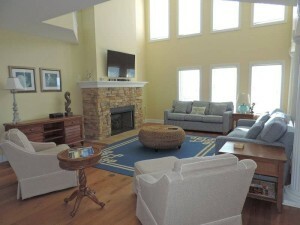 Emerald Isle Realty is incredible and respond promptly to any issues so we have an incredible stay. We already have our reservations for next year and have extended our stay to two weeks.” – E.S. Check rates and availability for this spectacular second row duplex and view additional property photos of Reverie.